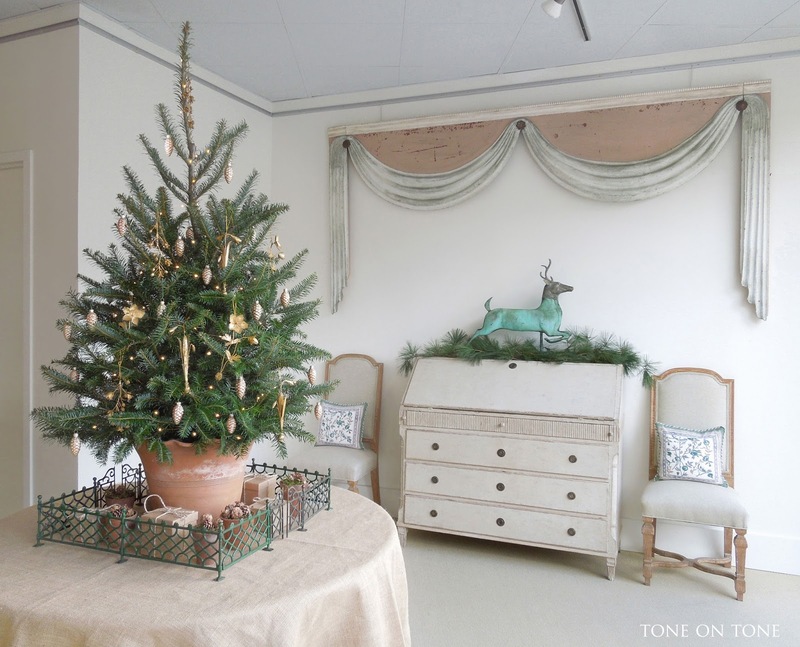 Welcome Christmas 2017 🌟 It's the most wonderful time of the year! 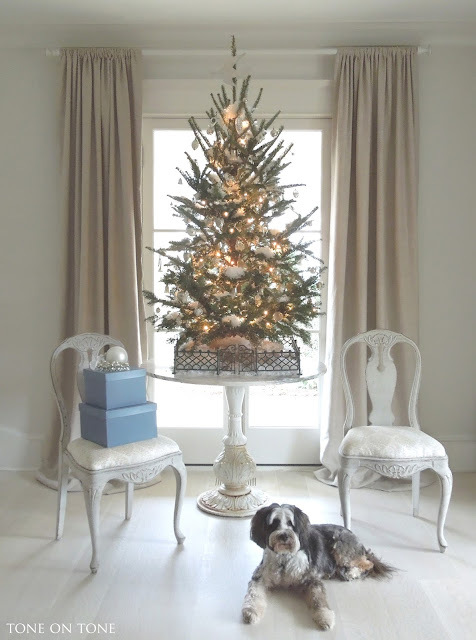 Hello, friends - Have you started decorating for Christmas and the holidays? Do you go all out with dazzling lights, seasonal colors, and a grand tree? Tom and I are nearly done and, once again, our decor is on the subtle side with a mix of old and new. 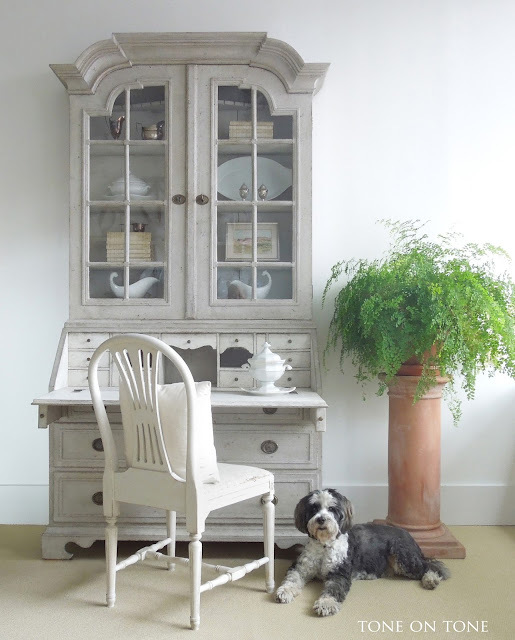 This year I selected a theme that is very personal and dear: antiques and the garden. My inspiration came from the garden with many items borrowed from our potting shed. Crusty terracotta pots, vintage trugs and baskets, old watering cans, burlap cloths, jute twines, velvety moss, pinecones of all sizes, and tole botanical ornaments are juxtaposed with period furnishings. I love combining the utilitarian with curated antiques. 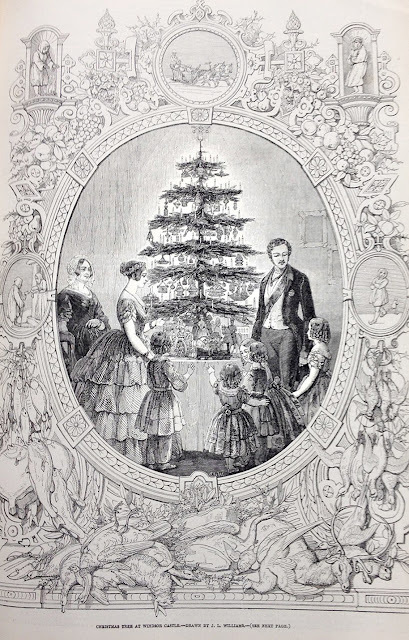 ...1848 engraving of Queen Victoria and Prince Albert's Christmas Tree at Windsor Castle in the London Illustrated News, I have been obsessed with these elevated little beauties. 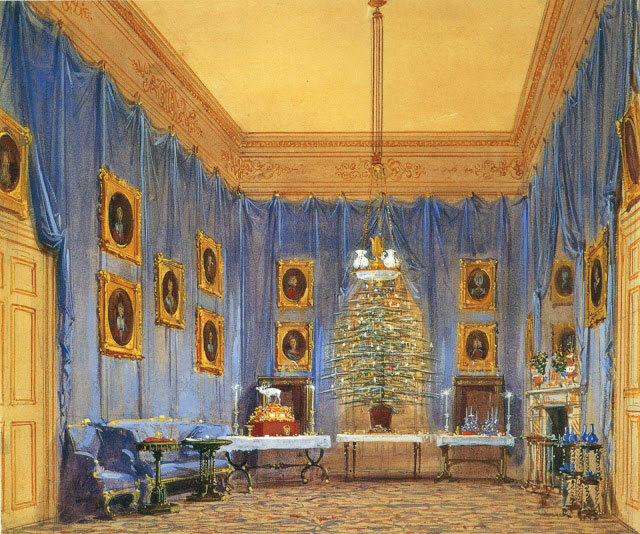 The article stated that each member of the royal family had his or her own tree atop a personal table covered with presents. Don't you love it? 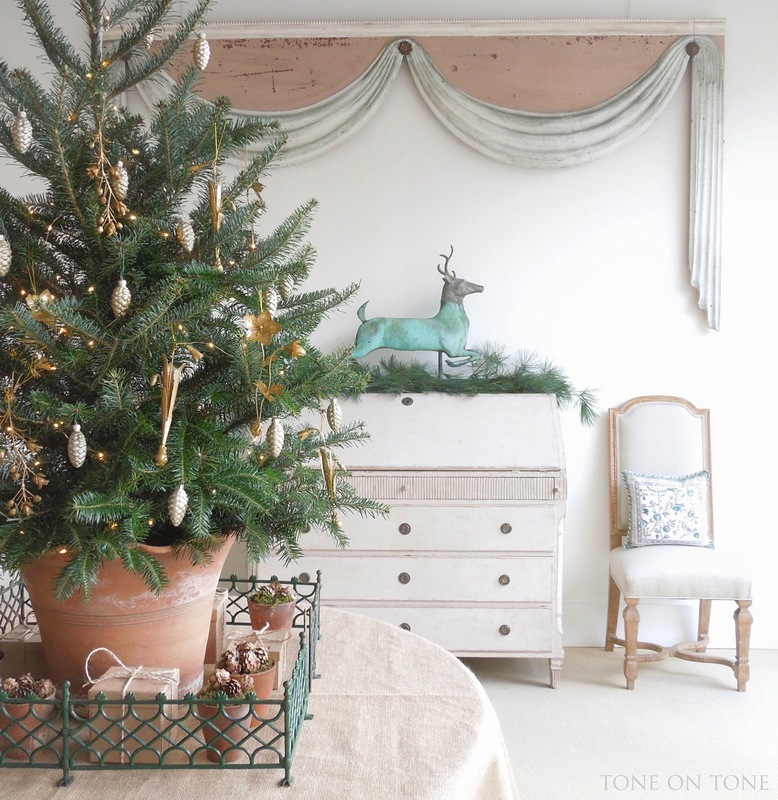 I find their gesture of giving the tree a place of prominence on a table so civilized. Immediately following the article, Victorian England soon copied those tabletop creations, making them fashionable and eventually common. When Godey's Lady's Book, a popular American women's magazine, published a similar print (below) in 1850, the craze for household Christmas trees spread to this side of the Atlantic. Most of the early trees were simply trimmed with homemade accoutrements at first, but became fancier as demand for imported German ornaments grew. 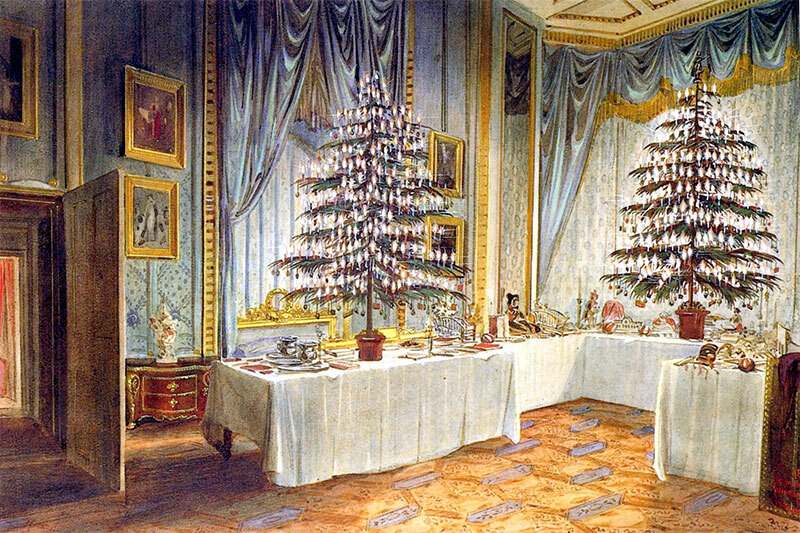 Eventually the ornaments became bigger as did the trees. 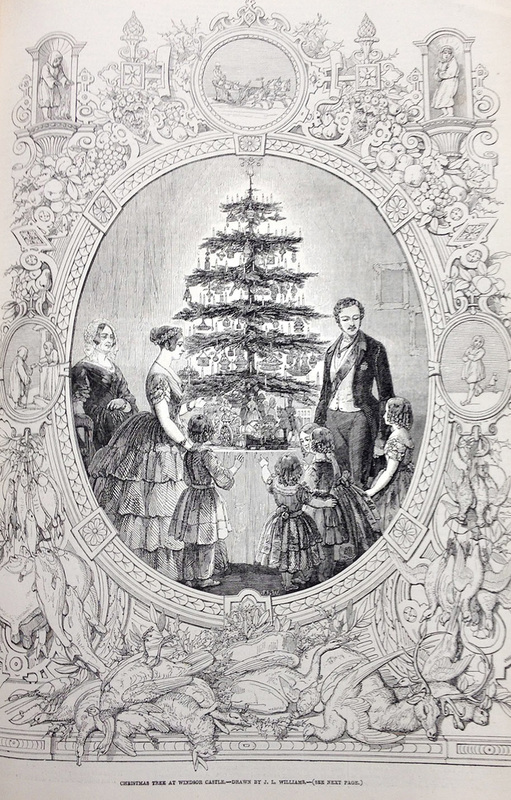 More illustrations of Victorian Christmas trees at Windsor. 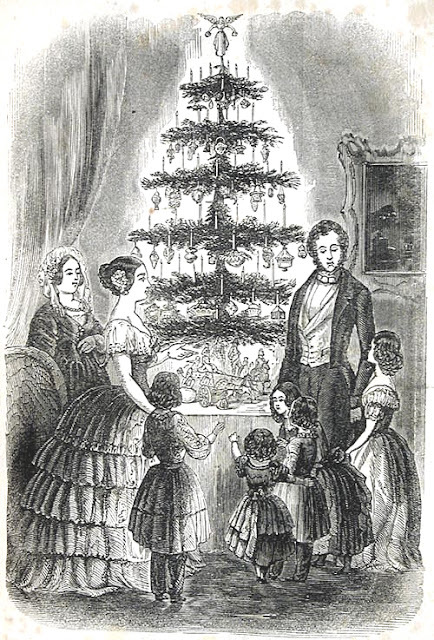 BELOW: An early print with gleeful children on Christmas Eve. 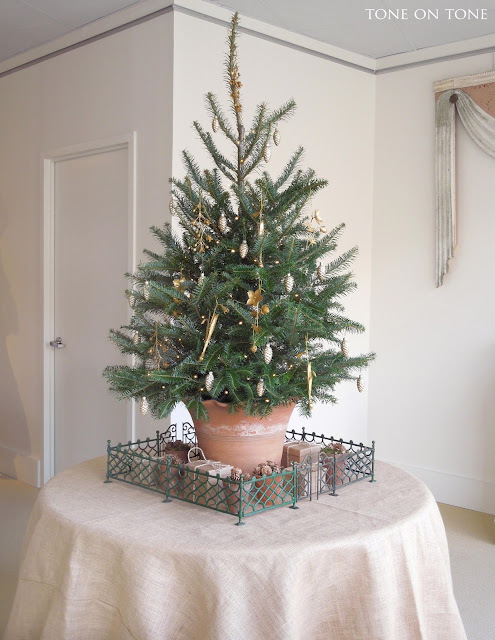 Here is our little Christmas tree dressed in a simple but festive way to celebrate the garden. 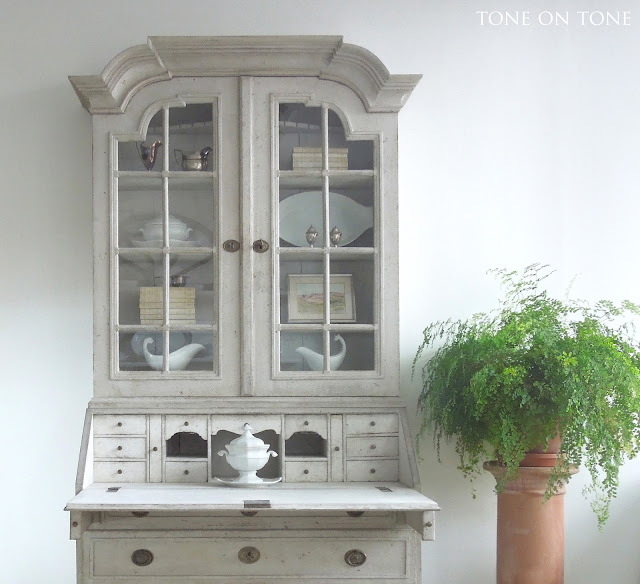 Tom and I decided to set it up among our antiques at Tone on Tone so that we could share it with friends and clients. Hope you'll come see it! Let's check out the details. 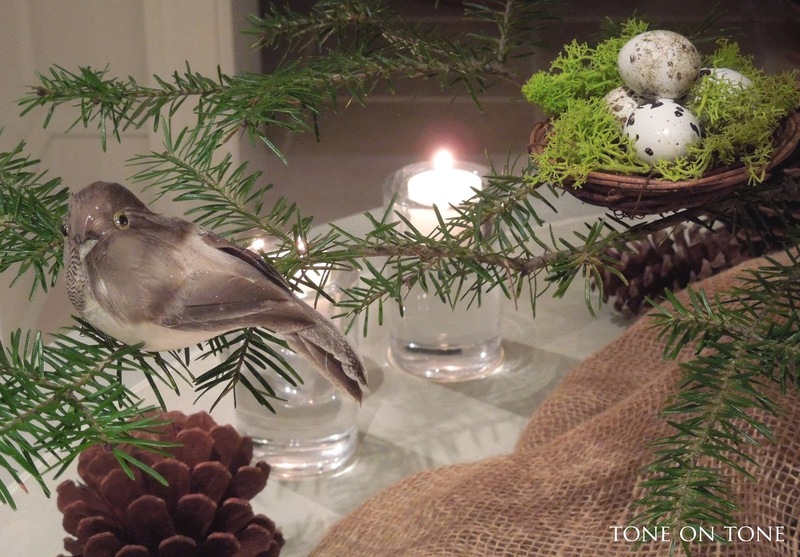 For the tablecloth, I went with a burlap round cloth in a 120" size which allows for a lot of puddling. It's not lined or pleated as I wanted a casual, unstructured drape. The Fraser Fir is actually sitting in a glass vase (with water) nested inside an old terracotta pot. 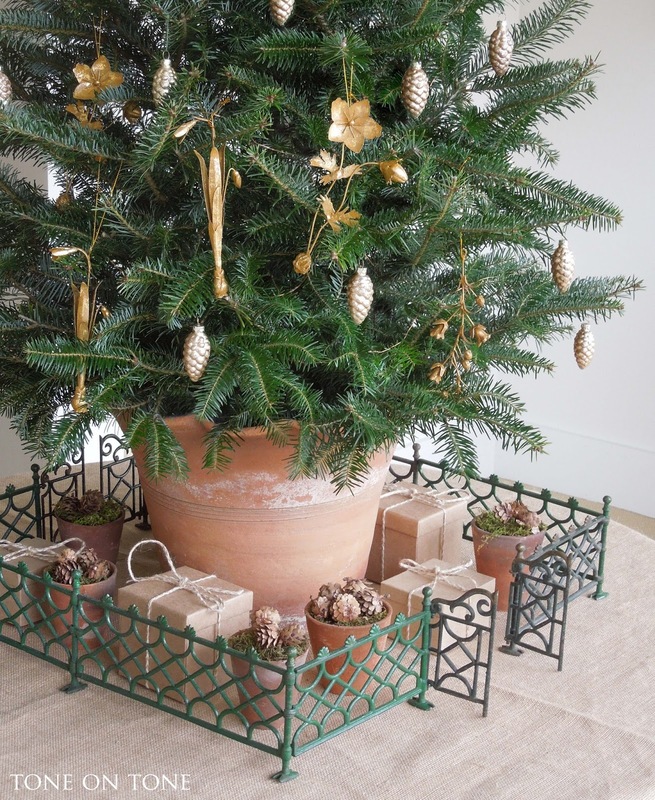 Around the pot is a Victorian cast iron tree fence dating from the 1880s. Aren't those little gates charming? 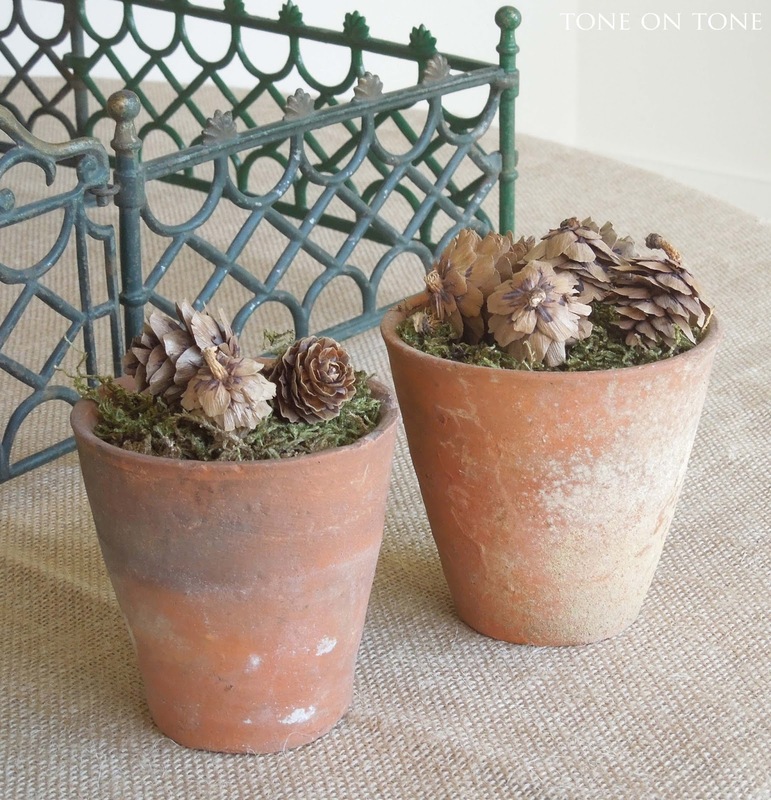 Terracotta pots, originally used to start seedlings, in sizes ranging from 3" x 3" to 4" x 4" are filled with mini pinecones over a bed of moss. 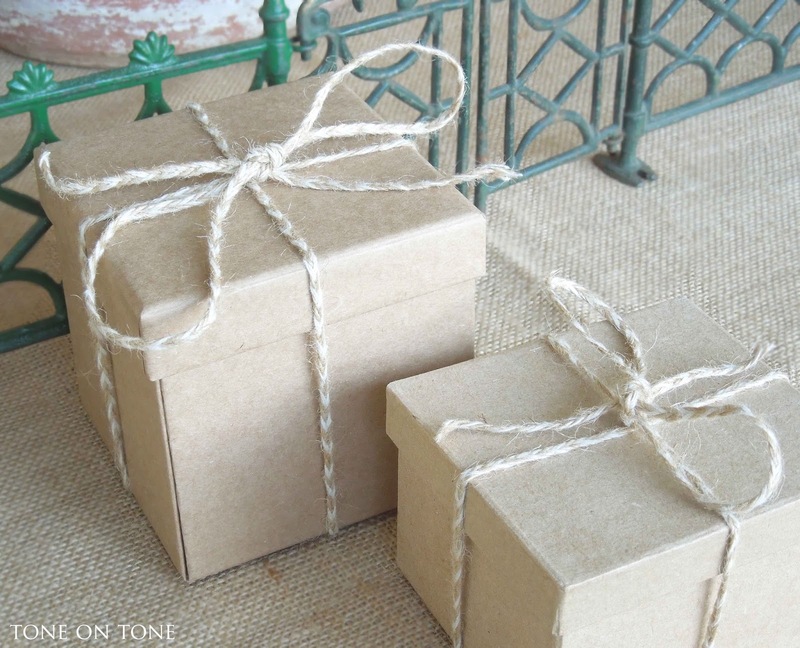 In lieu of glittery wrapped boxes, Kraft paper ones tied with braided twine borrowed from the potting shed give these presents an unfussy vibe. 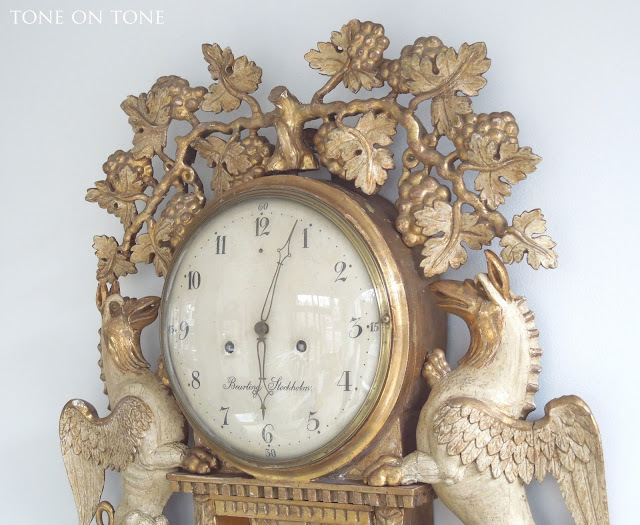 Sitting under the rare 18th-century architectural wooden swag from a chateau's puppet theater is a leaping stag or reindeer weathervane from the early 1900s. 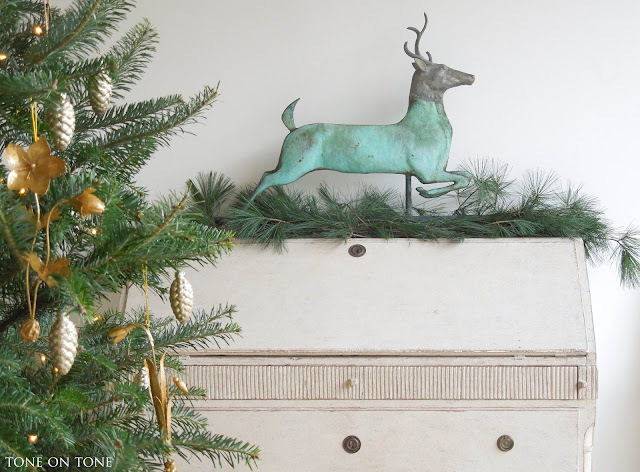 The patina on this reindeer is just superb. 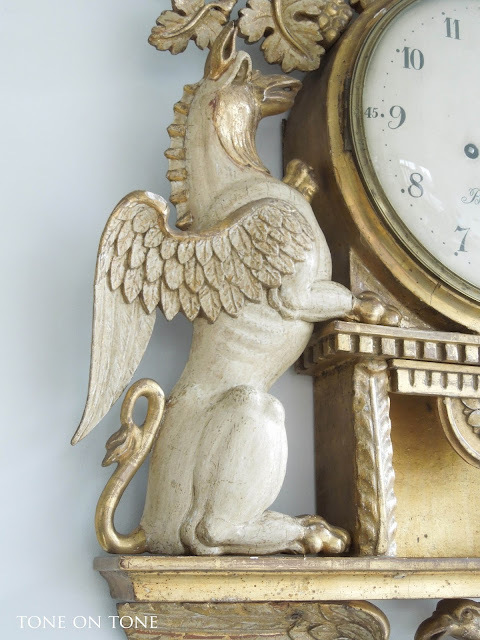 For more on weathervanes, please visit my post here. Gilded tole flowers, golden glass pinecones as well as copper twine lights give the tree a luminous glow. 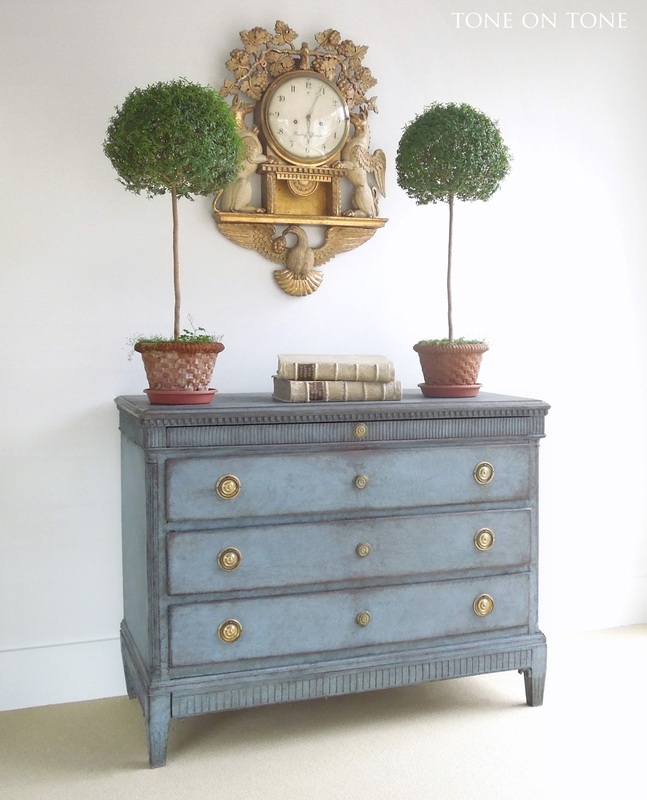 Here is another vignette from our shop. 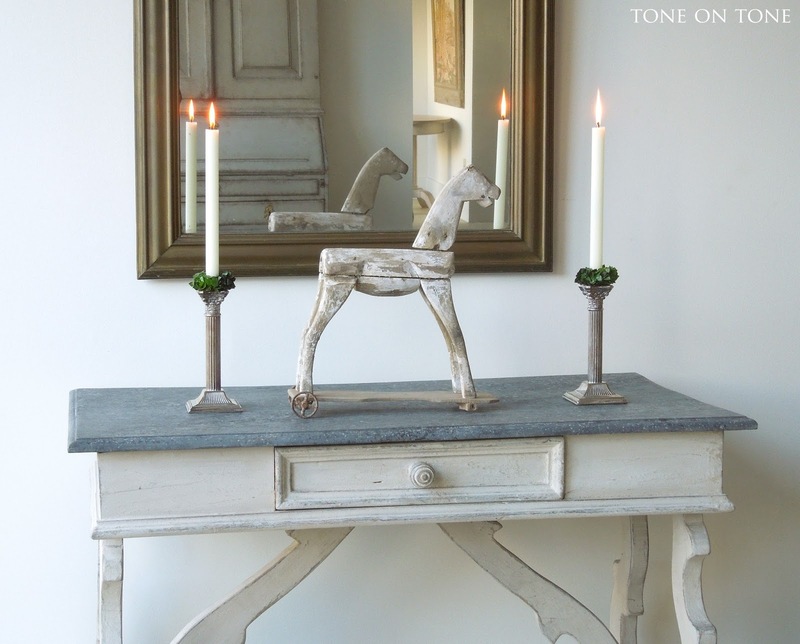 An antique toy horse sits on an early Spanish table with faux painted stone top. 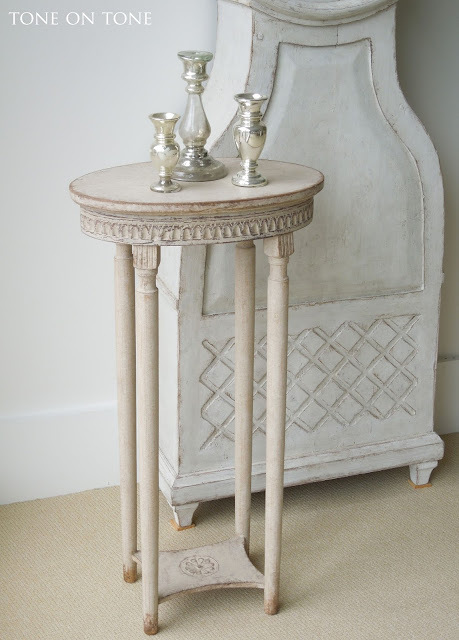 Under the table is an old French garden basket (not for sale - sorry) that was a gift from my dear friend Gail. With just a few oversized ornaments from Pottery Barn, it looks rather festive. See how I mix old and new??!! 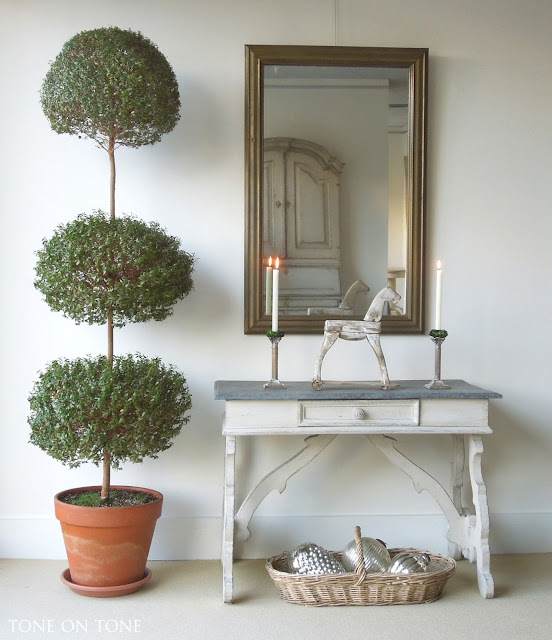 Something I look forward to bringing out every December is this pair of faux boxwood candle wreaths or bobeches. 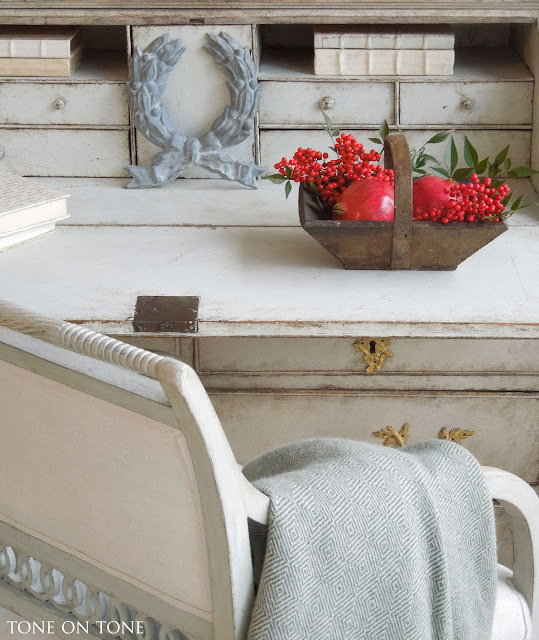 A Swedish Rococo painted secretary is styled with a small garden trug filled with Nandina berries and foliage plus pomegranates. 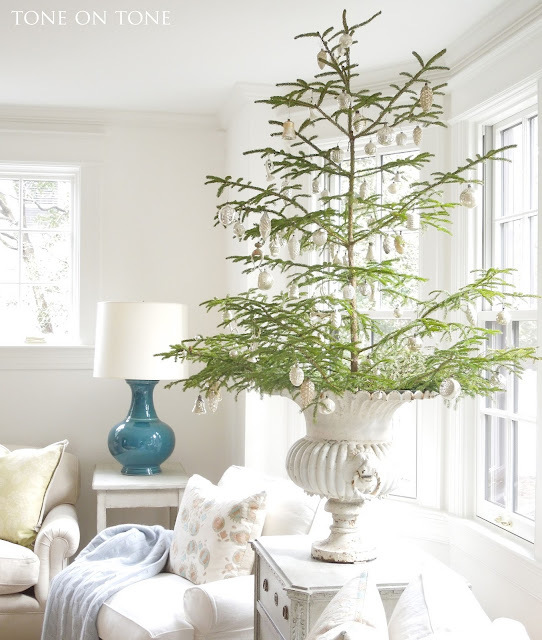 Gathering from Mother Nature gives your holiday home an organic, fresh feel. 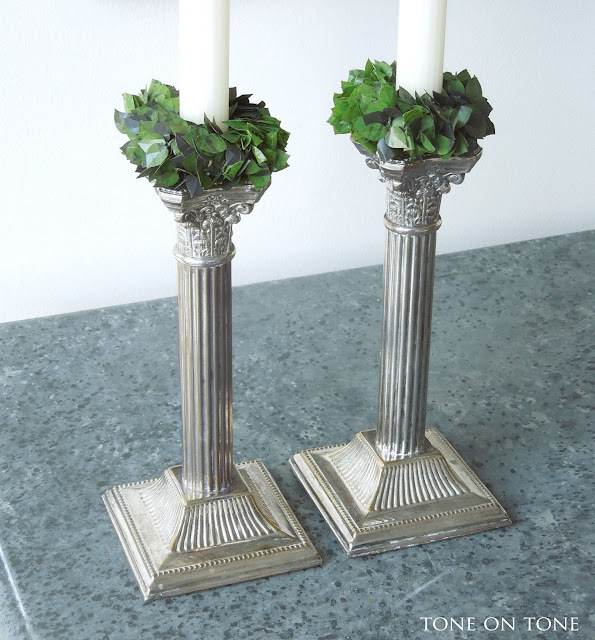 Another antique architectural element is this zinc laurel wreath. 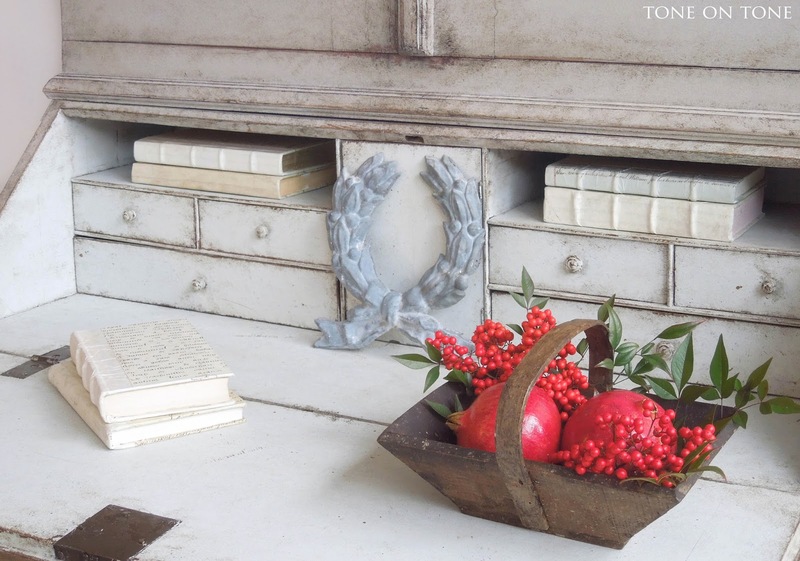 I like to include objects here and there that beckon to be picked up and admired. 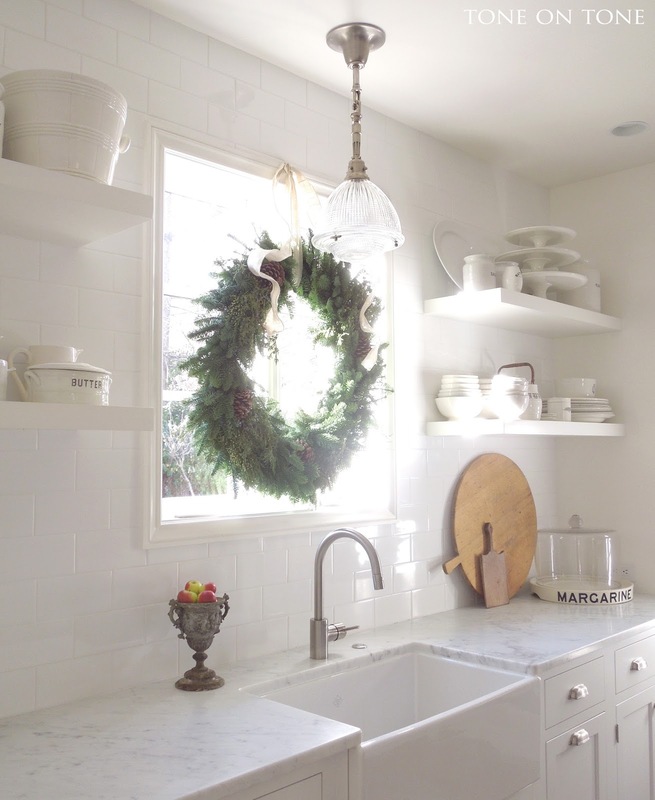 Speaking of wreaths, this fragrant one currently hangs over our kitchen sink at home - makes me happy staring at it while doing dishes. 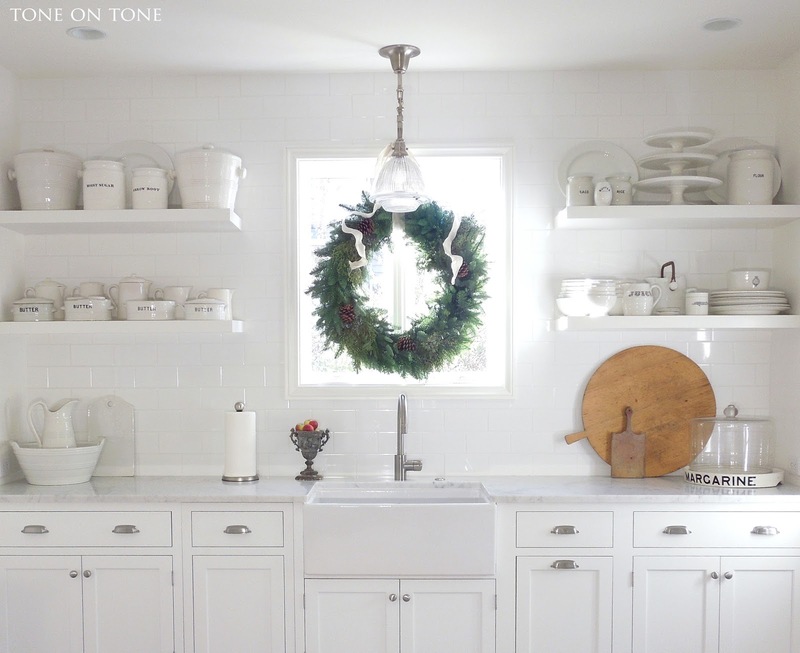 It also adds a pop of color to the white-on-white palette. 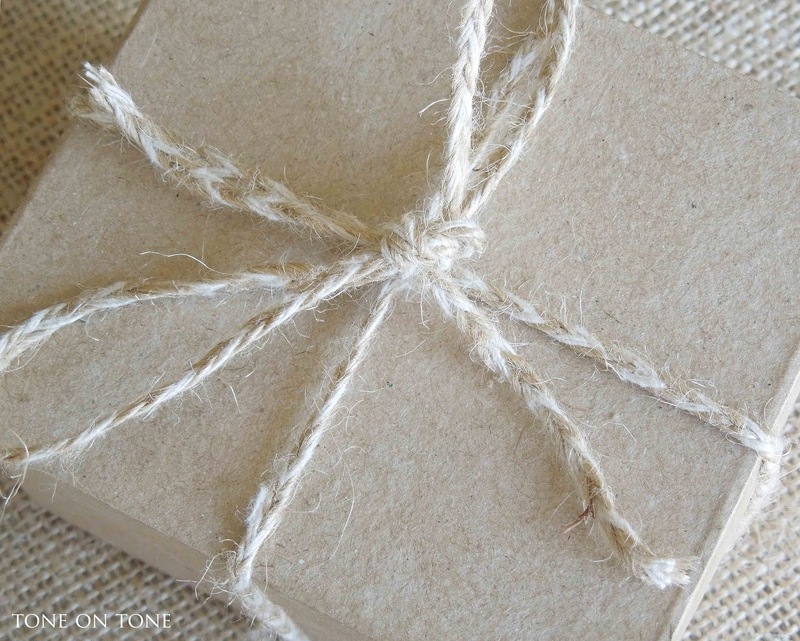 The ribbon is wired burlap in white. Again, I continued the garden theme with the burlap. 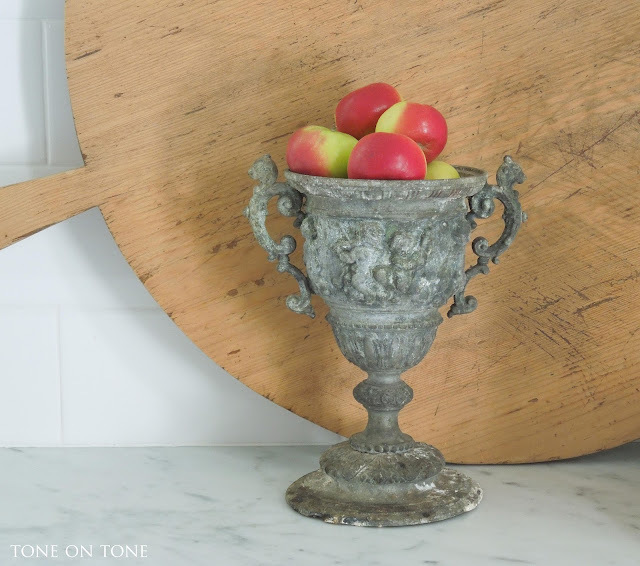 More fruit and berries: tiny lady apples dress up a diminutive iron urn while orange pepper berries in a watering can brighten our entry. 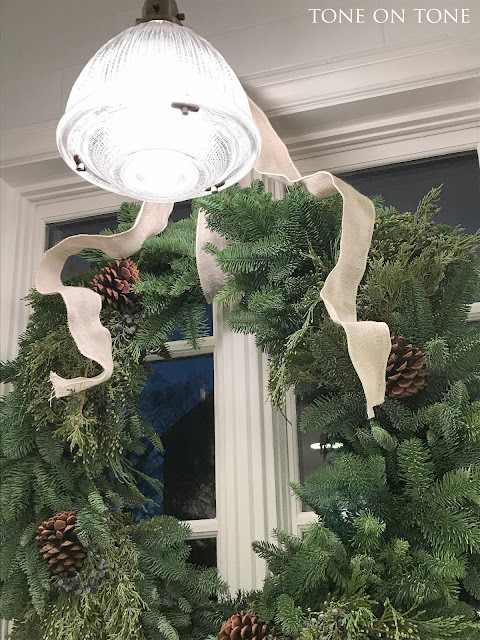 What do you think of our Christmas decor this year? Please let me know. For more, follow along on my INSTAGRAM where I'll be sharing new photos and videos. 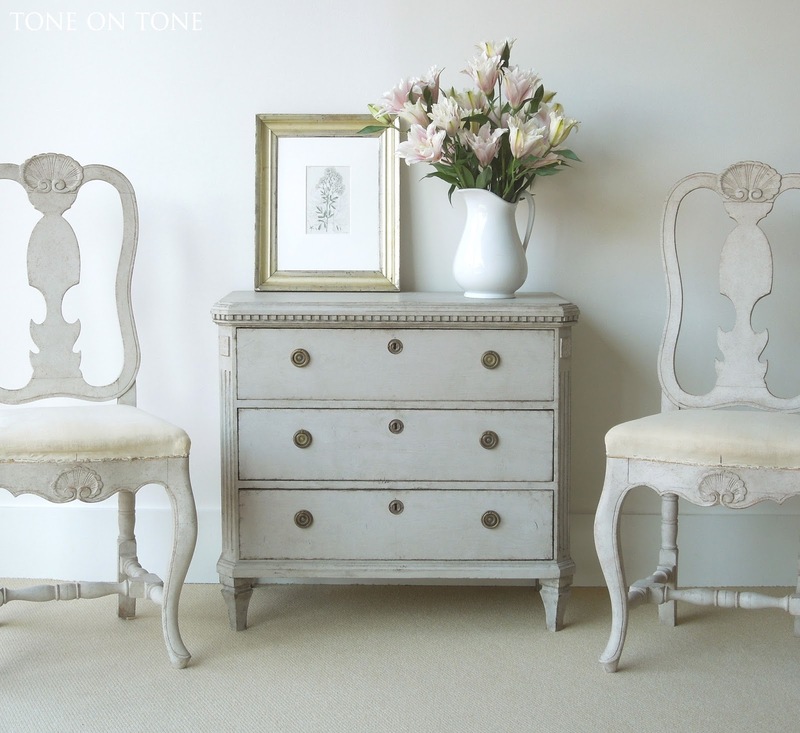 If you have questions, please email me at info@tone-on-tone.com . Thanks very much for your continued friendship and support. 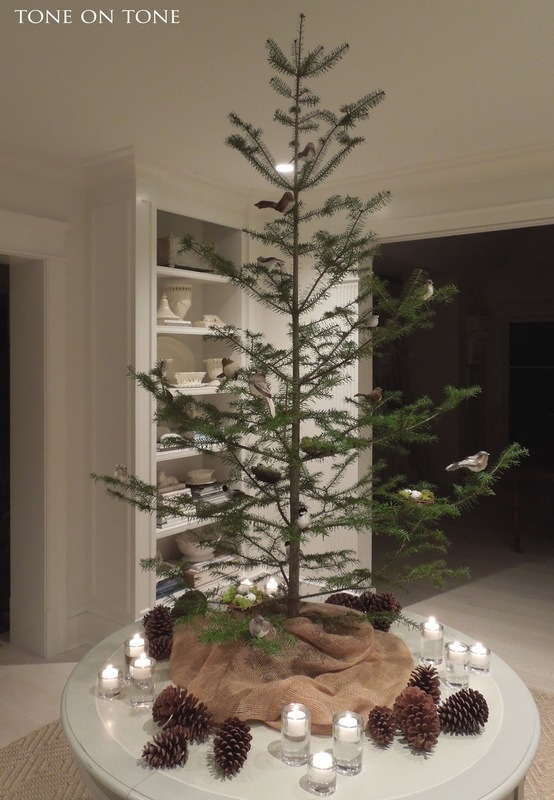 PS - Here is a recap of our tabletop trees from past Christmases. Enjoy! 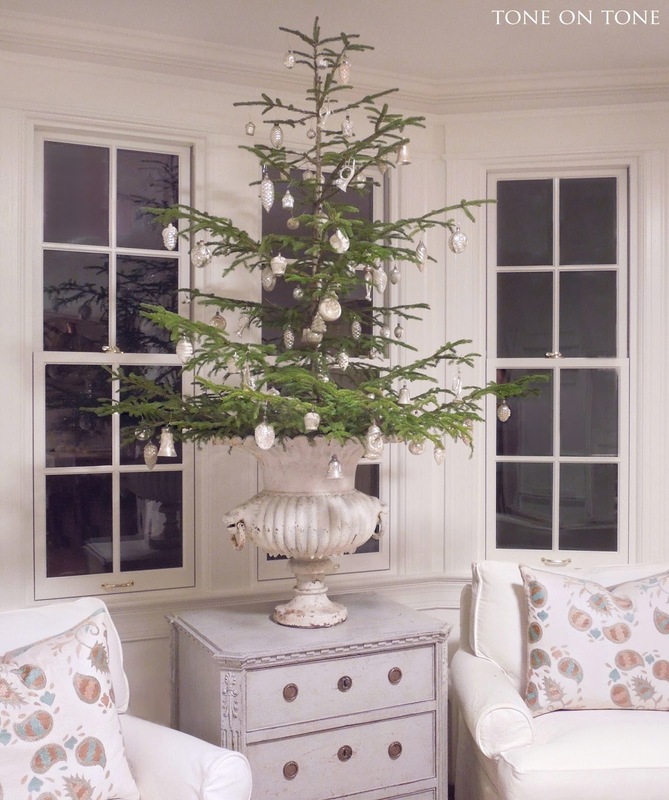 ABOVE 3 PHOTOS: Last year's Noble Fir came from our property in Maine. The theme was silver and white. 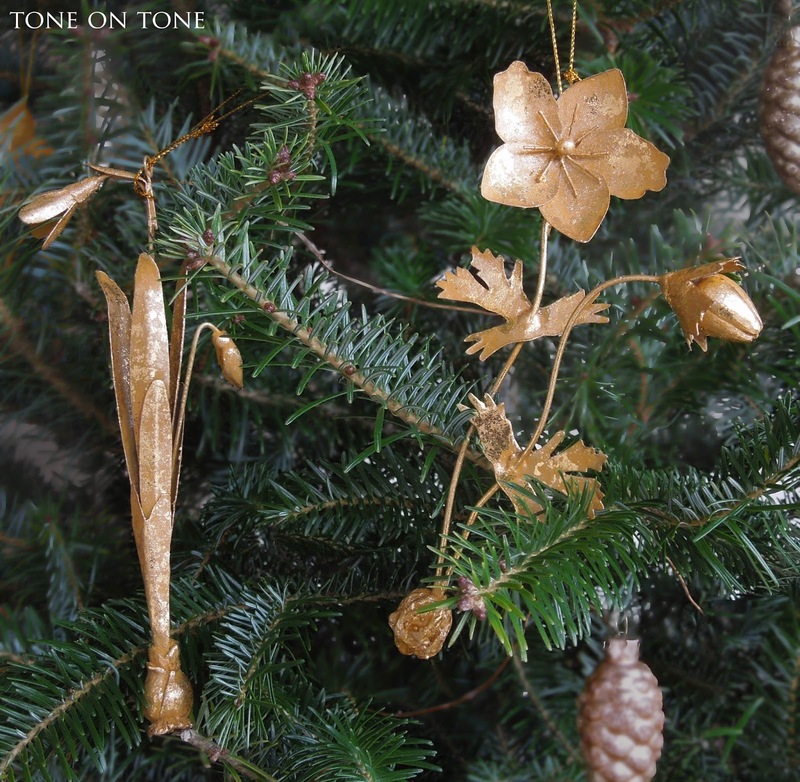 ABOVE: This tree from a few years ago was decorated in a wintry way with dusted snow, mercury glass and icicles. BELOW 3 PHOTOS: Another fir from Maine, this Charlie Brown tree was unusually sparse. 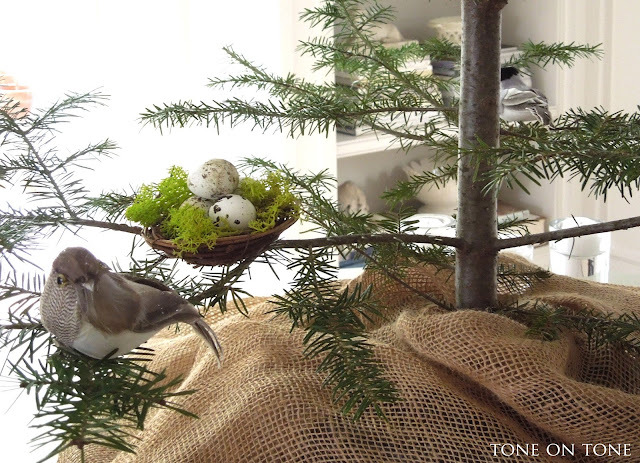 I went with a woodland theme and layered it with birds, mossy nests with quail eggs, and pinecones. 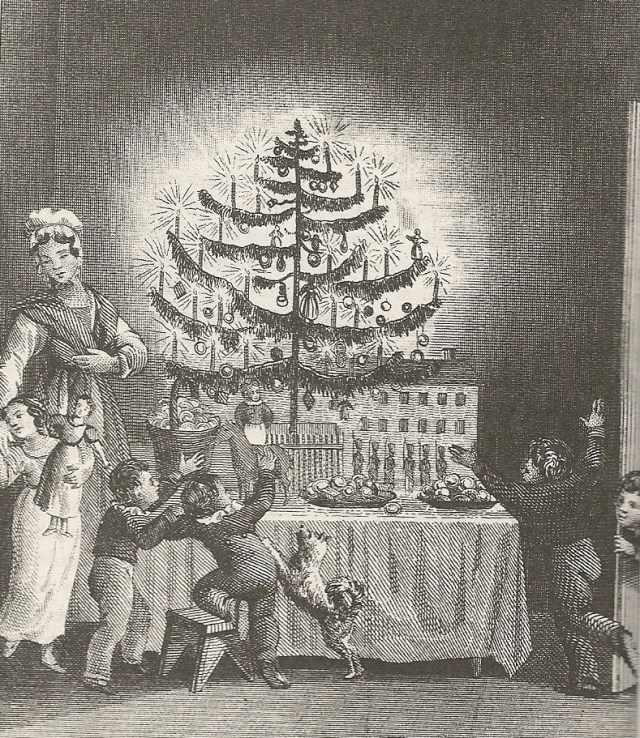 It was illuminated with votive candles. 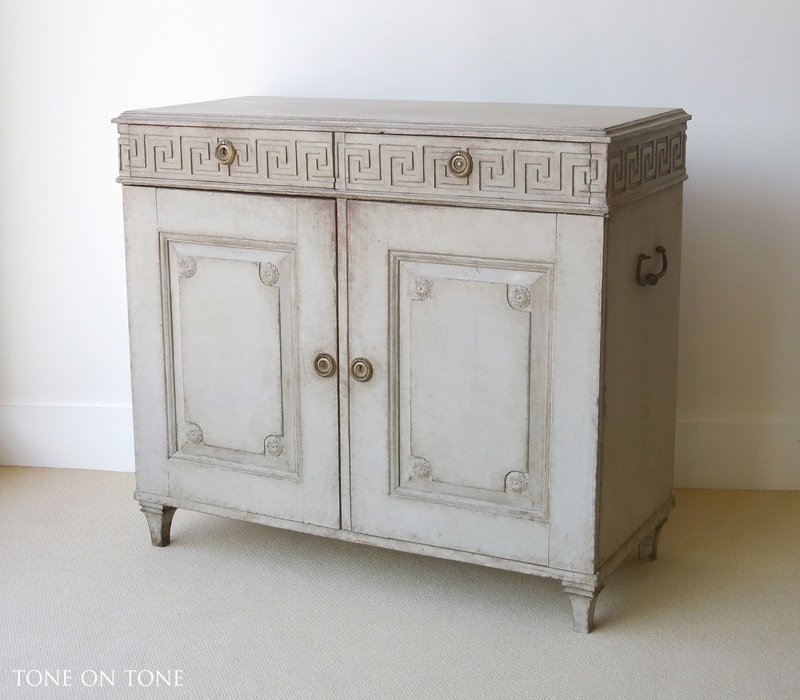 New Shipment at Tone on Tone! Greetings from Tone on Tone! I'm thrilled to share a preview of our newest shipment which arrived last week. For this collection, Tom and I traveled to Scandinavia to source a curated selection of case goods - sideboards, chests of drawers, cabinets and vitrines (cupboards with glass doors). There are also tables and seating. I'll be posting more on our shop's website and on my Instagram. 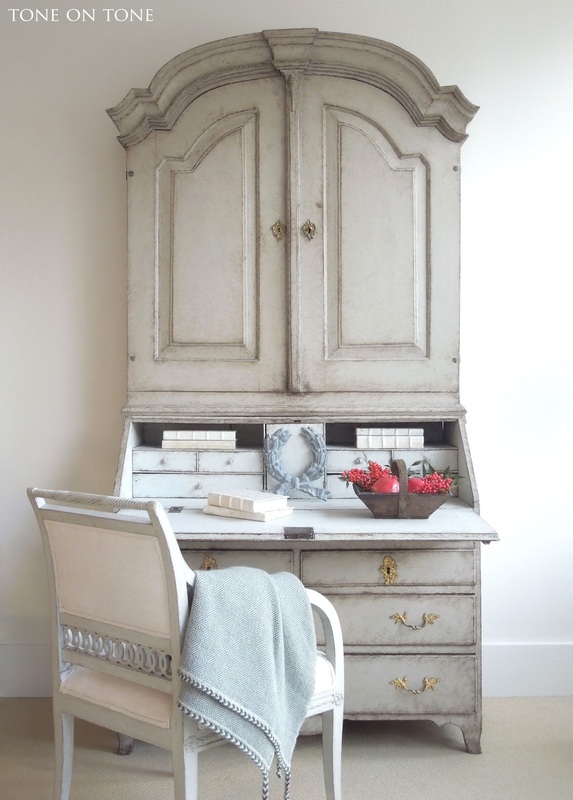 First up is this late 1700s / early 1800s Swedish secretary with a pretty form. 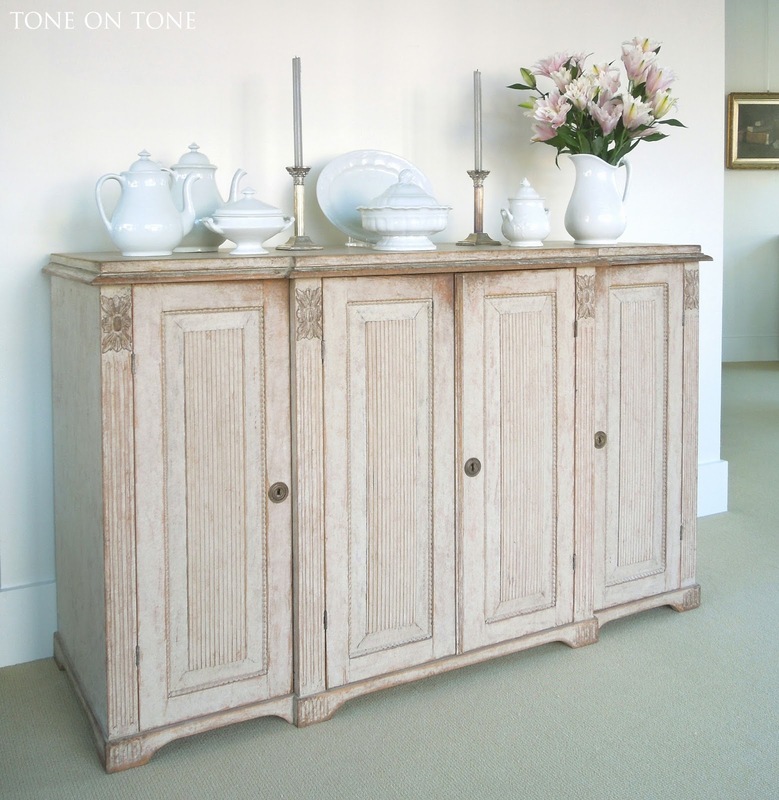 The top part features an arched cornice and a pair of glass doors with divided muntins. 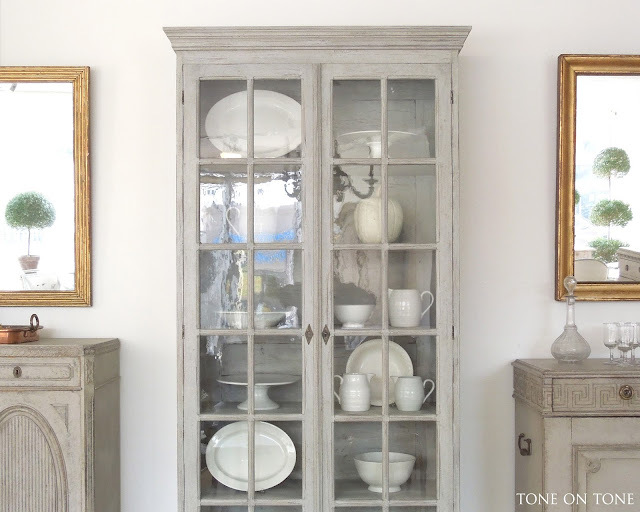 I've styled it with ceramics, silver, books and a small watercolor painting. At a beach house, I'd display shells, coral and driftwood. 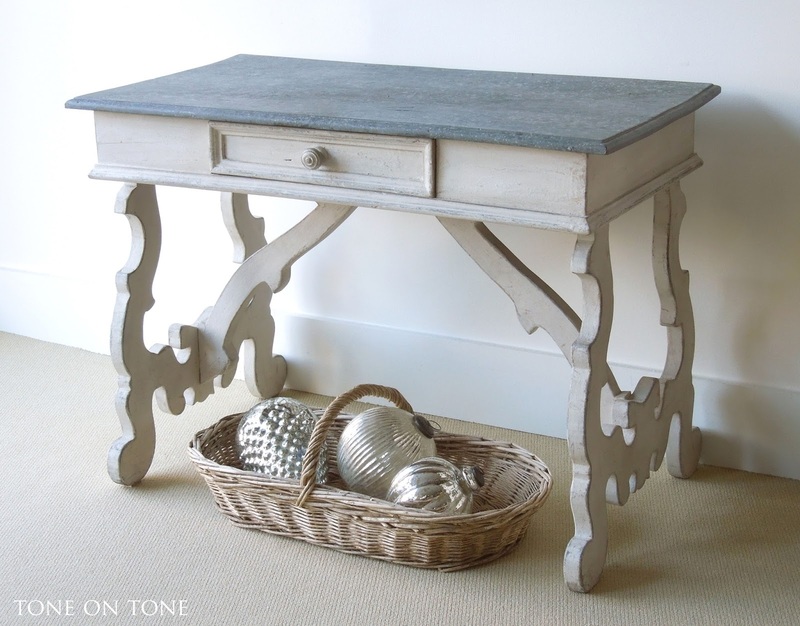 It's such a versatile and neutral piece, most anything would look amazing and important in it. 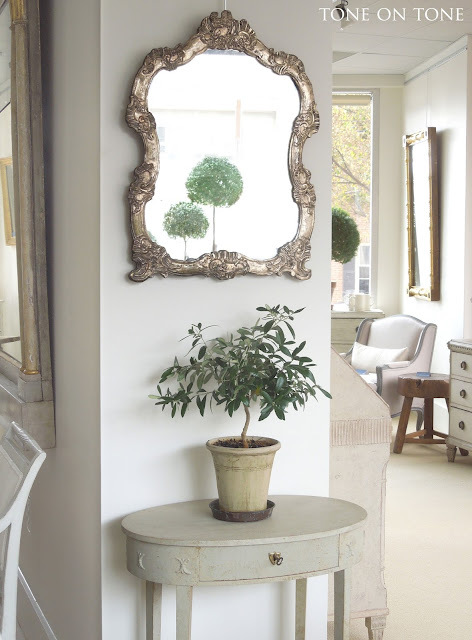 Putting something behind glass seems to elevate its status! 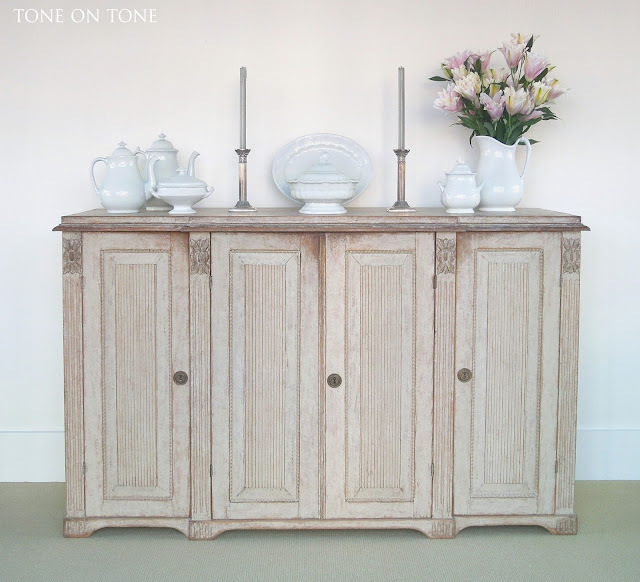 Here is another cabinet with glass doors. 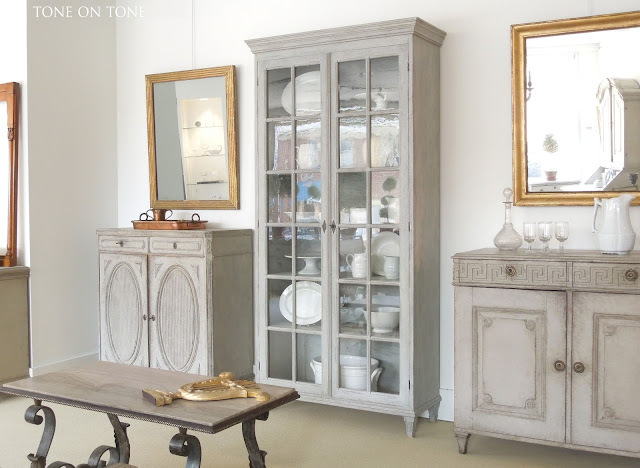 With full length glazed doors, this Swedish vitrine (45" w x 16" d x 90.5" h) shows books, china and other collections elegantly. 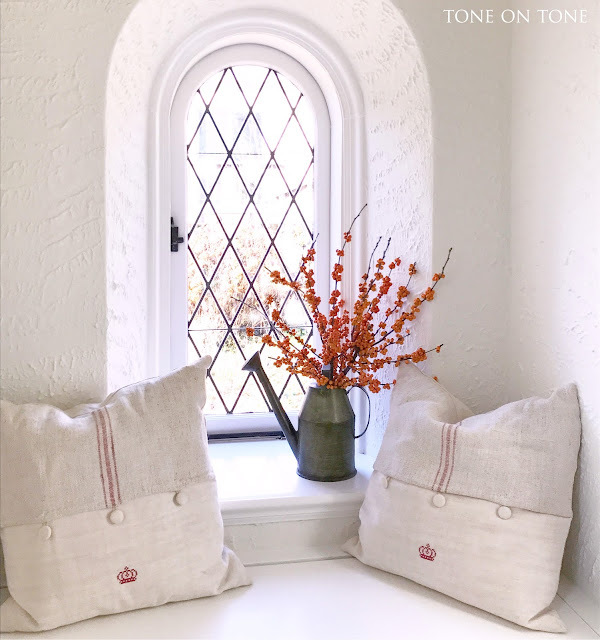 The panes of wavy glass give it luminous depth. In the shipment is a selection of sideboards. At 64.25" long, this Swedish Gustavian style sideboard holds quite a bit. 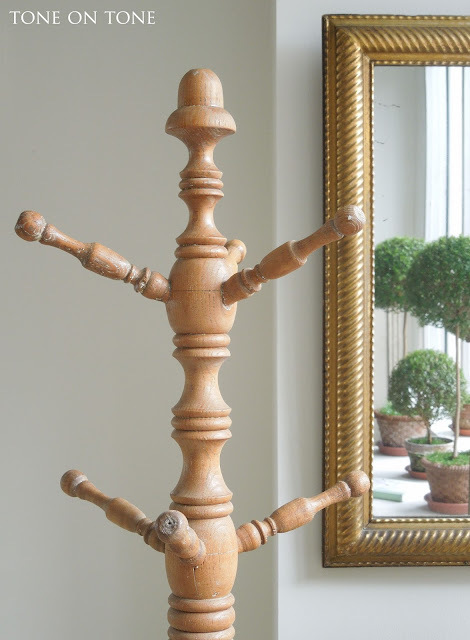 It would be fabulous as a focal point on a dining room wall, or in a family room under a flat screen TV. Both ends step back from the center slightly, visually breaking up the expansive surface. 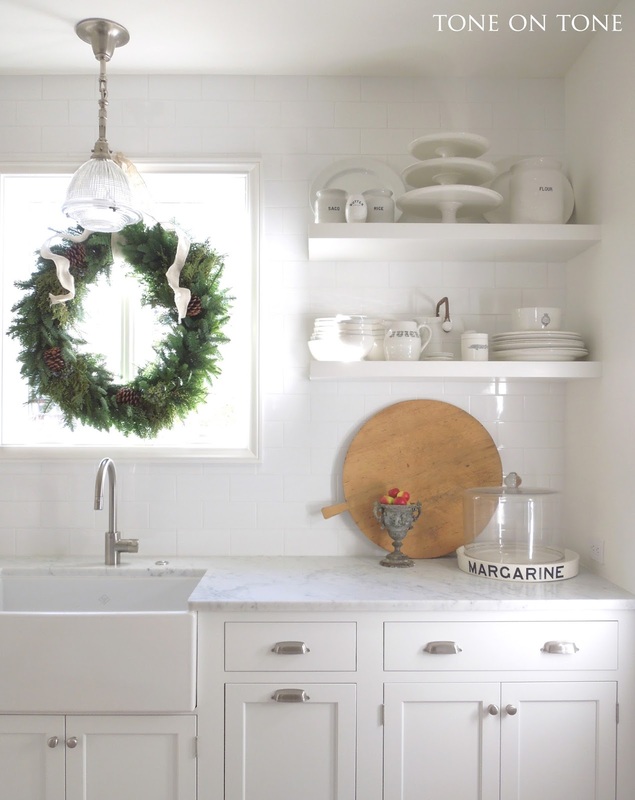 The holidays are coming - is your buffet ready for gatherings? Time to bring out those gleaming white ironstone serving pieces. 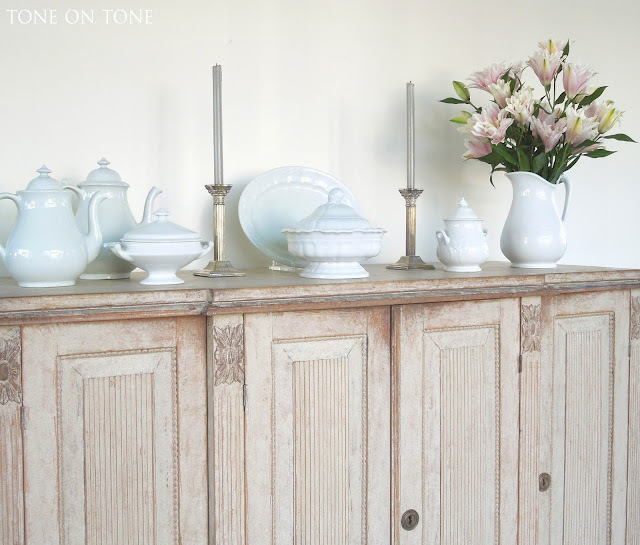 I've stocked the shop full of this favorite antique china of mine. With ironstone, more is definitely better. I love them en masse! 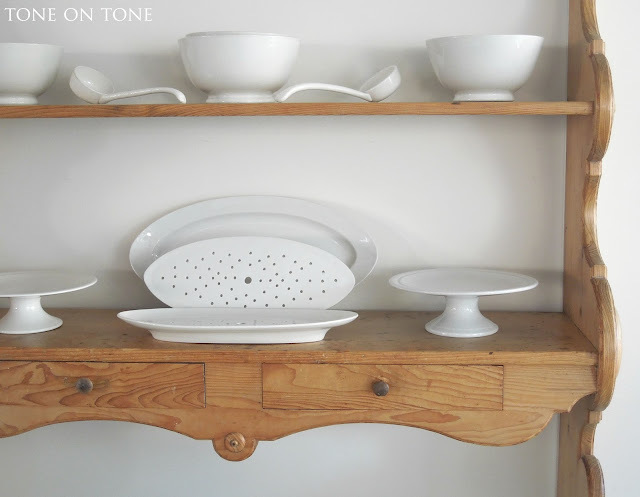 To read about ironstone, click on my post here. 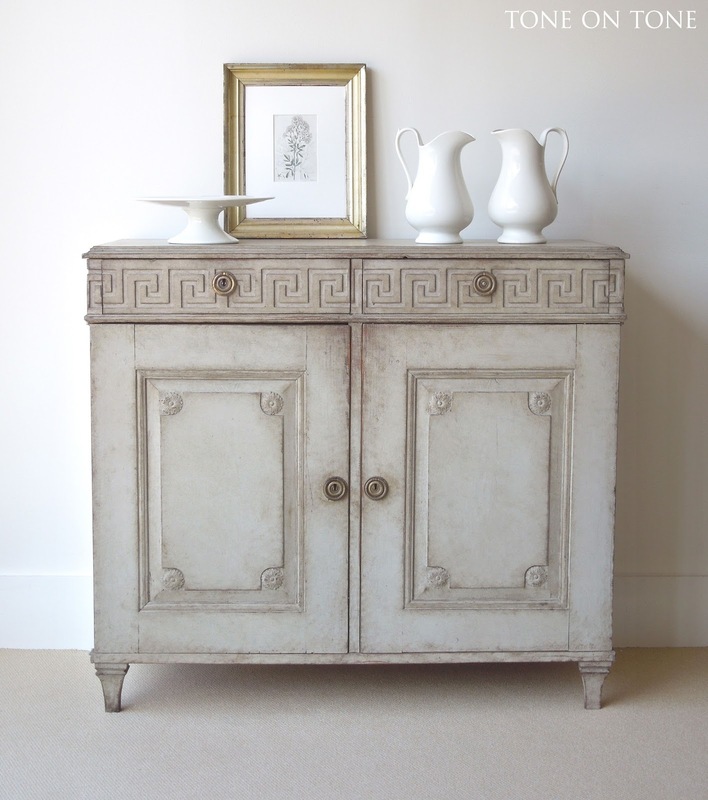 Next is a Neoclassical sideboard / cabinet with fabulous architectural lines. 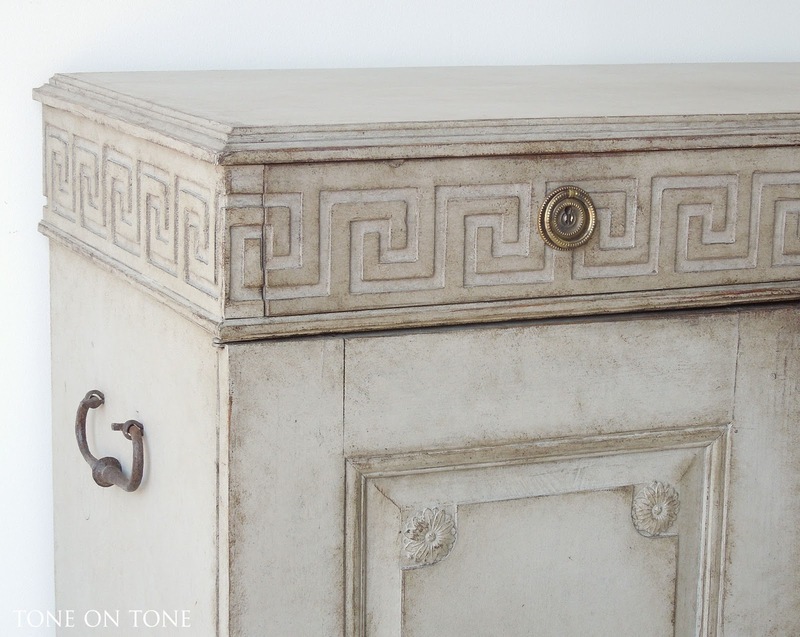 Check out the Greek key frieze that wraps around the top drawers and sides - isn't that cool? The doors have raised panels with rosettes. Note the wrought iron handles on each side. 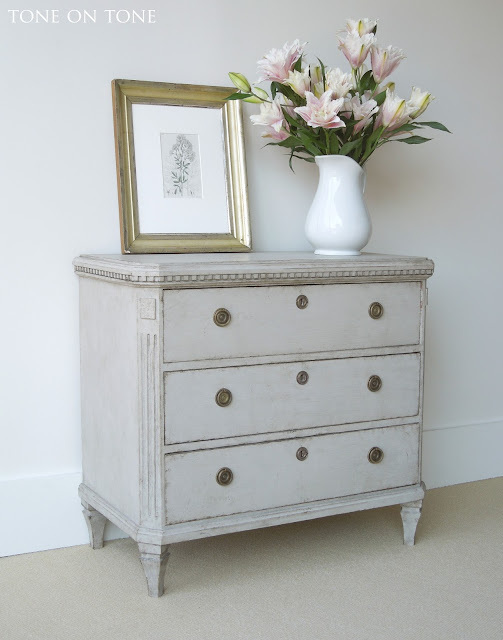 We currently have many chests of drawers in various sizes. 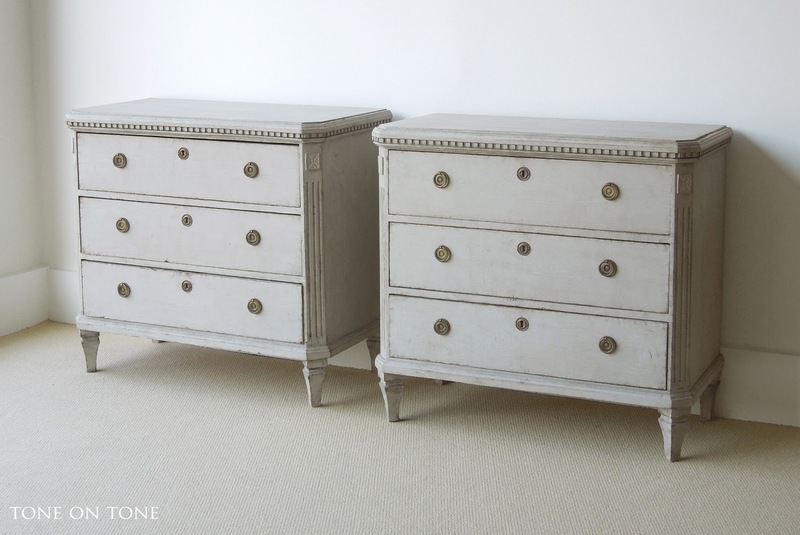 Here is a pair that's ideal as bedside chests. Each measures: 32.25" x 16.5" x 29" high. Speaking of chests, this handsome one from circa 1790s really makes a statement in form and color. 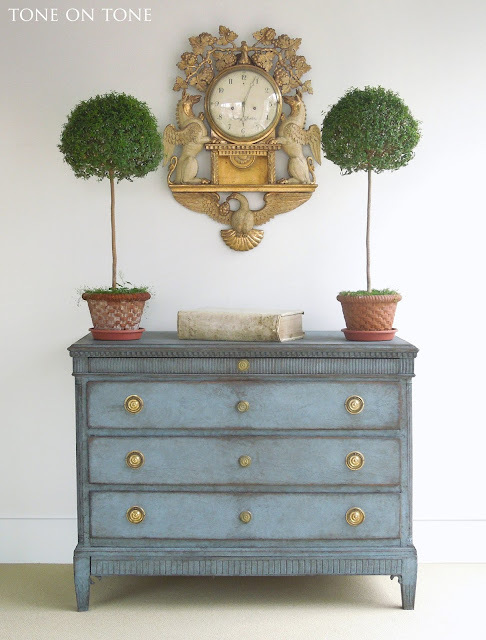 It's larger than the average chest, and that deep blue is definitely not neutral! 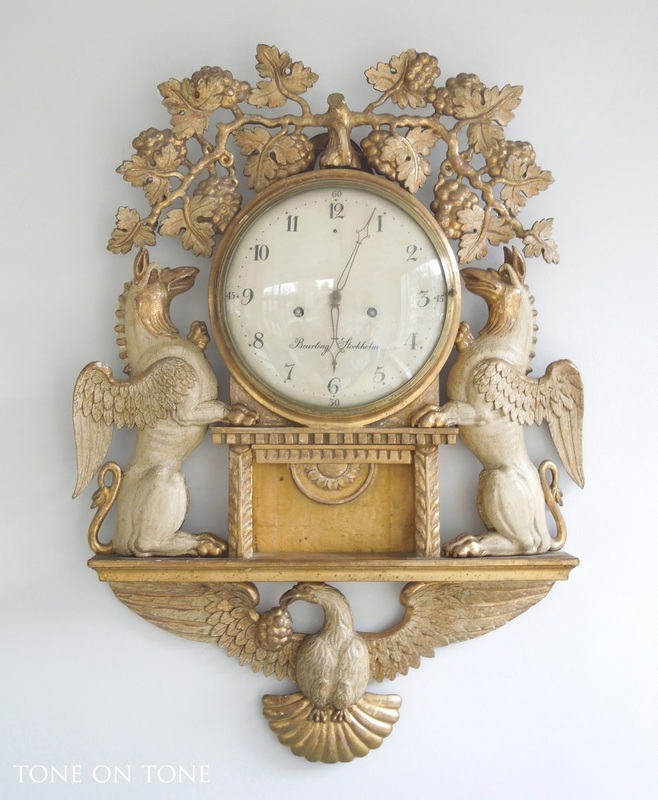 From Stockholm master clockmaker Peter Henric Beurling's (1763-1806) atelier comes this Neoclassical cartel clock with original gilt and polychrome surface. A crest of grape vines, foliage and berries adorns an enamel dial supported by a plinth and flanked by mythical winged horses sitting over a spread eagle. 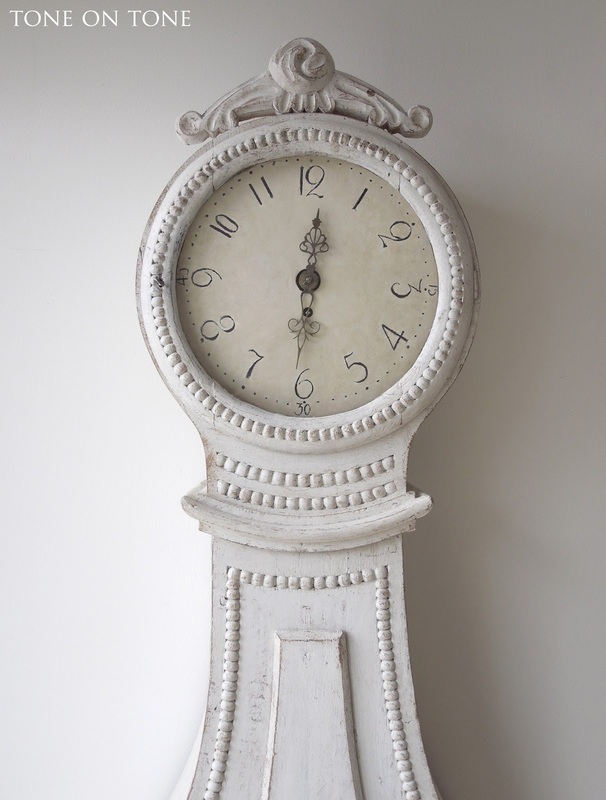 All in all, a very finely crafted wall clock. 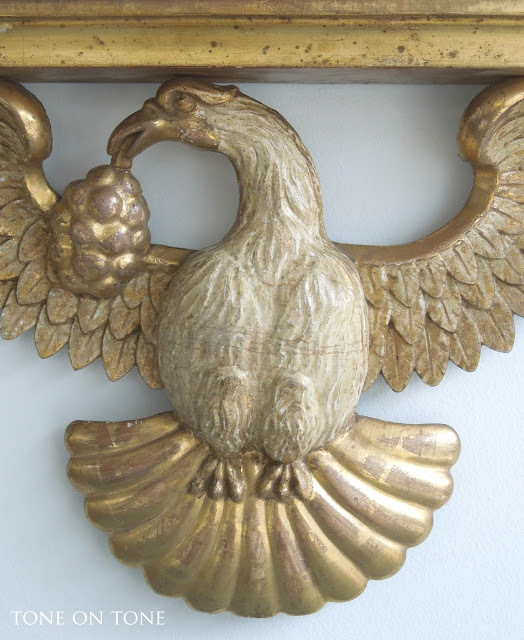 A cluster of grapes is suspended from the eagle's beak. Perhaps this was commissioned by a wine connoisseur or vintner? Here is a very different kind of clock. 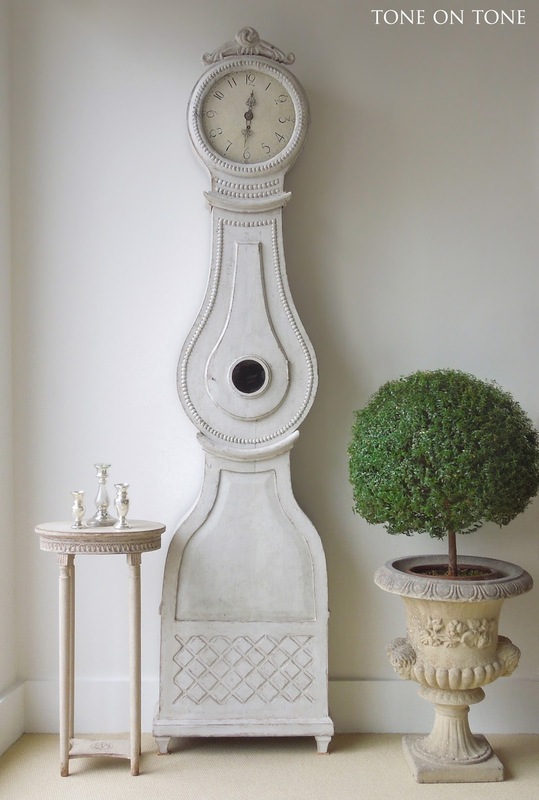 Painted in a chalky pale gray with lovely details, it's an elegant example of a Swedish Mora clock. The round hood and curvilinear waist both have beaded trim resembling strings of pearls. 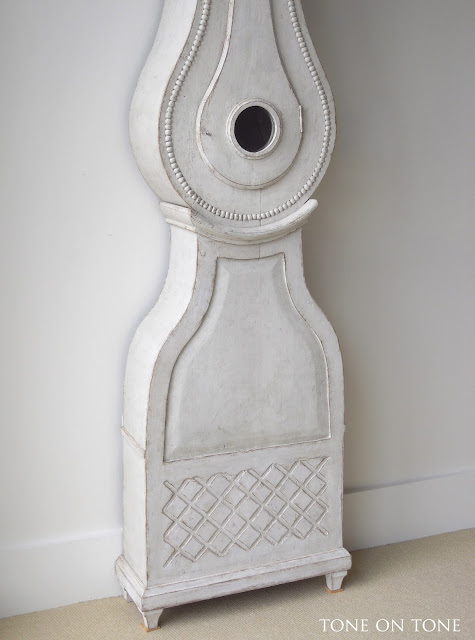 The footed plinth is carved with a crisscrossed latticework. I've shown this petite table next to the Mora clock for scale. 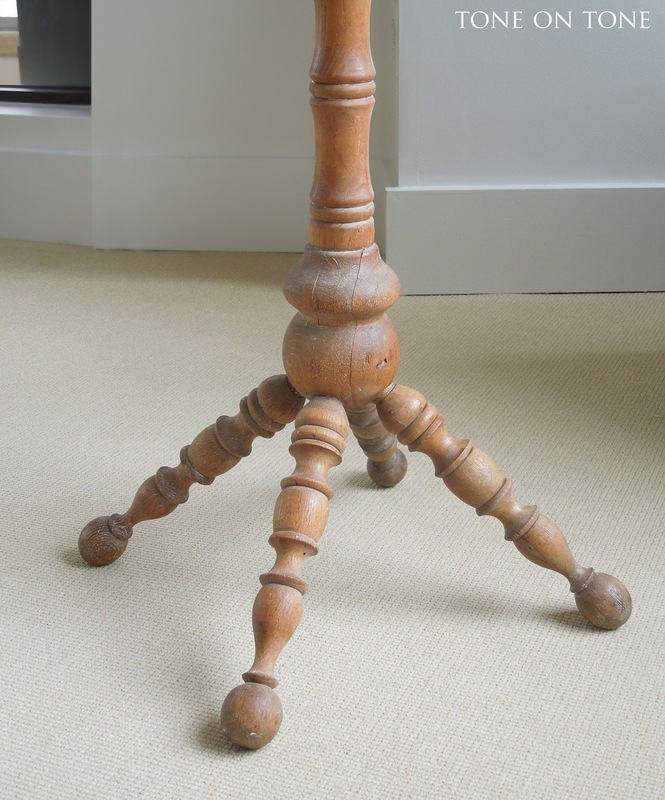 At 10" x 16" x 30" high, it's small and scarce. 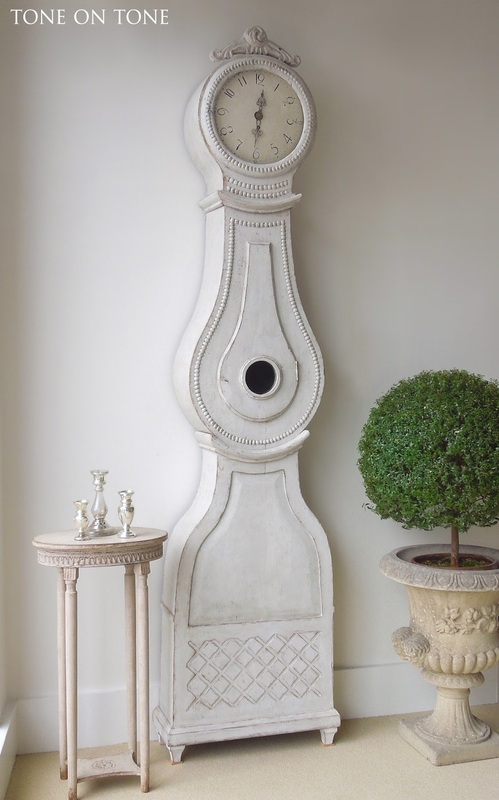 I'd place it in a powder room, foyer or anyplace where a little table would be handy. Let's look at some unpainted items. Do you recognize this antique wall rack? Tom and I came across it in France, and bought it for our former home, where it anchored a wall in the mudroom. 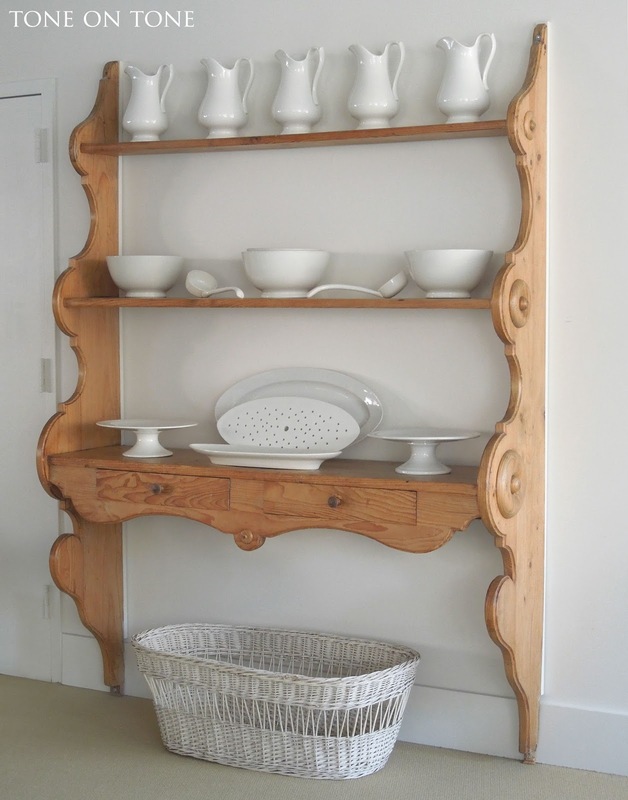 We originally wanted built-ins, but decided against that after finding this one-of-a-kind piece which reminded us of a baker's rack. In all of our homes, we always incorporate found objects with unique character. 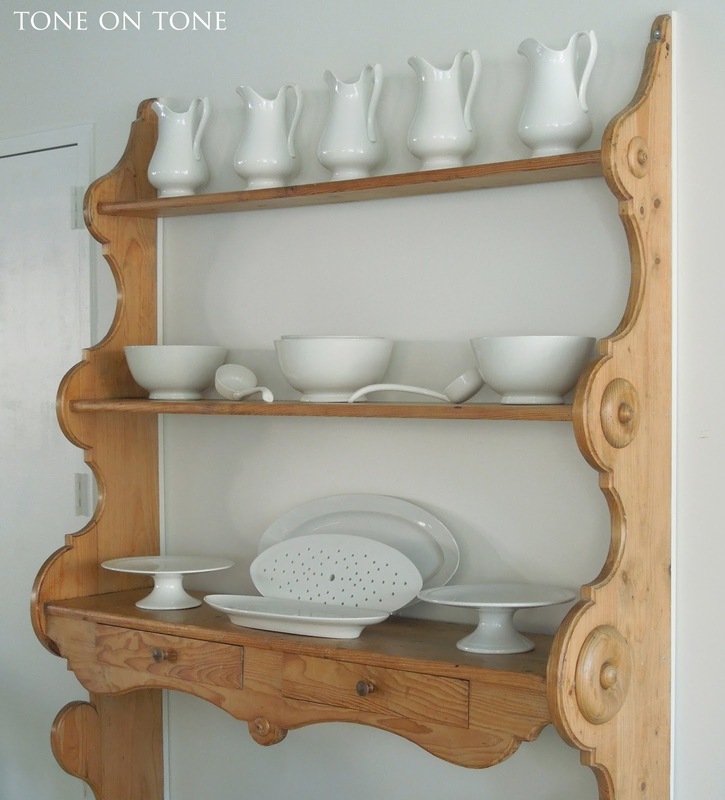 With three graduated shelves there is plenty of surface to display. 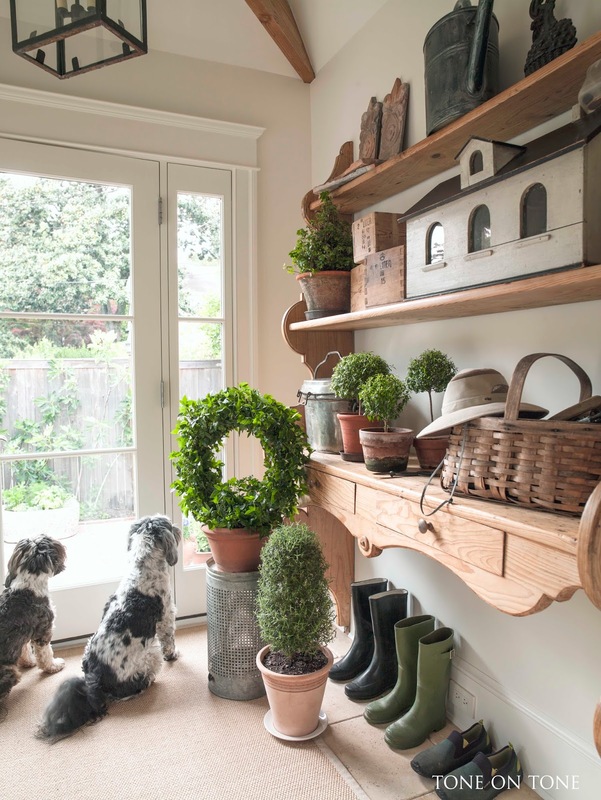 For storage, wicker baskets (very complementary to the pine's mellow patina) on the shelves would work well. 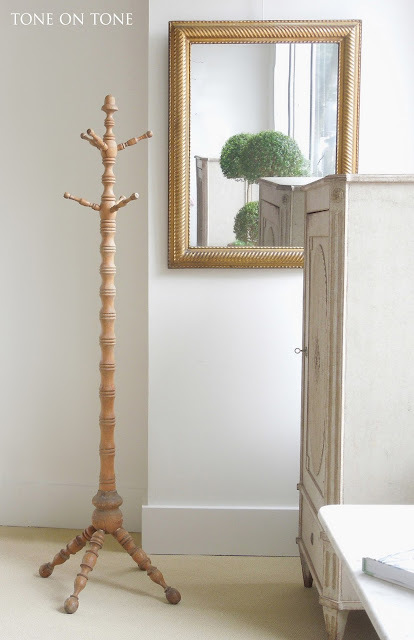 When it comes to accessories, I cannot resist the quirky ones like this early oak hat / scarf tree with turned spindles and stripped surface. In addition to the foyer, use it in a bathroom for towels, child's bedroom, master closet, etc. The Empire strikes back! A tiny Empire period mahogany chair that would've been a chairmaker's sample. Compare it to the life-sized Danish armchair with very similar lines. 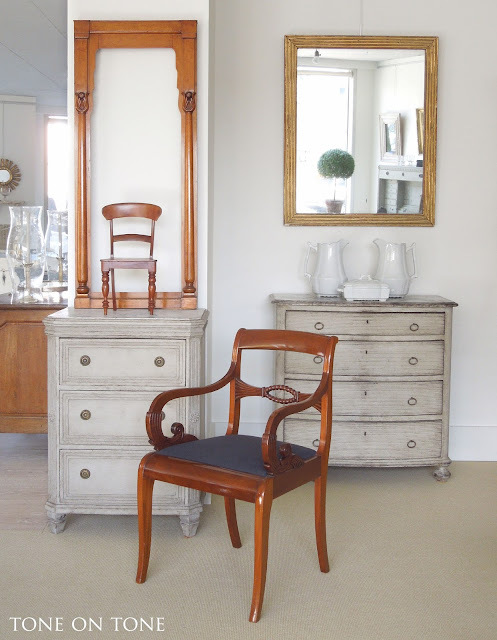 Both chairs are from circa 1840s. 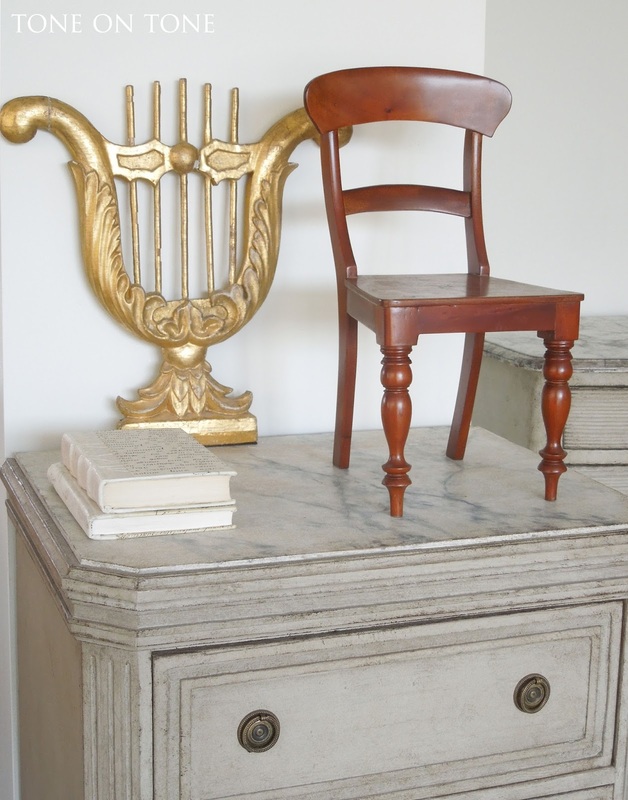 As is the giltwood lyre architectural fragment. 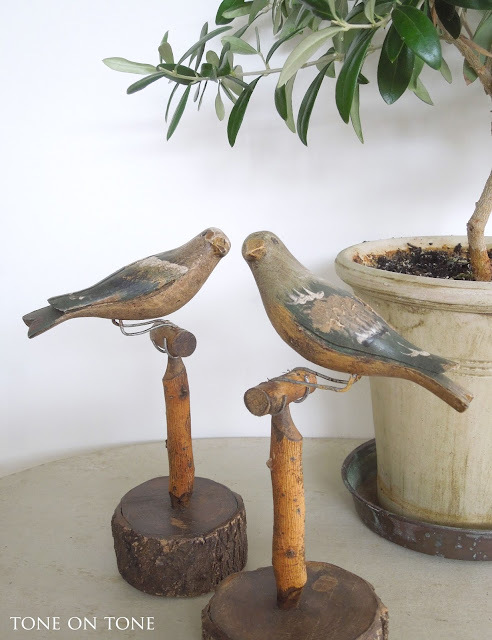 Now for something charming: a pair of carved birds perched on twigs. Not all birds fly south for the winter - these are in the shop ready to greet customers. 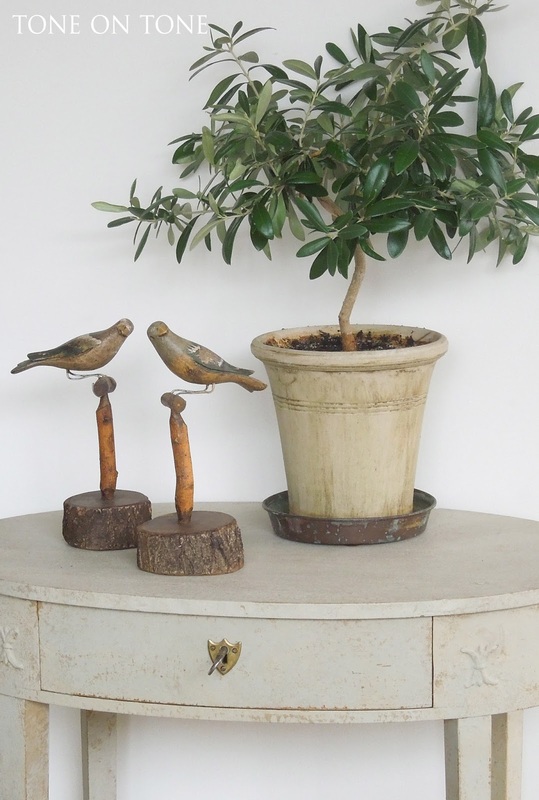 I hope you've enjoyed seeing some of our new arrivals. There's a lot more! Thanks for touring the shop :) Feel free to email me at info@tone-on-tone.com if you have any questions.